Inhabiting the intimacies of voice, language and the discreet materiality of our immediate world Looking in either direction the whole street was filled with people, some singing, moving towards x... is a vivid mediation on the politics of the unsung, unuttered and the tangible passion of collectivity in the everyday. Featuring the breadth and fluidity of Copestake’s oeuvre that traverses sculptures, prints, installation, moving image works, performance, text and sound, the exhibition navigates the simultaneous fragility and ‘joie de vivre’ of human communication and its necessity for a communal recognition. An abiding character of Copestake’s practice, in all its myriad forms, is a subtle focus on the ‘soft power’ of orality and its often intense relation with the moving image. For Copestake, this approach does not mean that one voice is privileged over another, instead it is a tactic to draw close attention to the social and political fabric of language and how a lone voice immediately calls another to recognise its presence. In this call for a response, the voice, whether as speech, text or image is always constitutive of a collective; a community in which life is not experienced in solitude, but lived ardently in the company of others. Developed from ongoing research into loss, grief and the desire for the recognition of unacknowledged lives, Copestake’s new site-specific installations for Cooper Gallery consider the complex emotional registers of presence and absence. Copestake’s text and paper sculptures draw upon this evocation of being and non-being, for instance the paper cloak, Walked and walked and walked; space, time, love, divulges a literal reading of a mundane world where the body is wrapped by languages of borders and boundaries. To encompass the essential fluidity at stake in Copestake’s practice the exhibition will also feature audio works that will be subtly reconfigured throughout the exhibition, alongside existing and new Super8 films including Jealousy and Flirtation, Laughing Woman and A Love. Balanced by the inherent informality of her seminal project Trigger Tonic, which introduced one artist to another and videotaped the unrehearsed encounter, documenting a period of time in Glasgow, the exhibition at Cooper Gallery reveals a singular artistic practice that evades the declarative spectacle of the contemporary world in favour of a communicative, collaborative and always egalitarian engagement with the words and acts that cause us to see and witness each other. Anne-Marie Copestake is an artist based in Glasgow. She works with moving image, audio, performance, print and sculpture. Recent moving image works have focused on portraits of a kind, foregrounding a number of women and aspects of their lives, the emphasis has been to consider conditions that have surrounded choices, or a lack of choices, made by the women, and to explore the landscapes and environments that may have contributed essentially to these conditions. Her recent exhibitions and screenings include: Stalking the Image: Margaret Tait and Her Legacy, Gallery of Modern Art, Glasgow; Margaret Tait film/poems, The Pier Arts Centre, Orkney; Projections 2: A Blemished Code, Tyneside Cinema, Newcastle-Upon-Tyne; Soft Fiction/And Under That, Irish Film Institute, Dublin; Prantik Basu, Ailbhe Nic Oireachtaigh, Anne-Marie Copestake, Old Hairdressers for Glasgow International, Glasgow (2018); Experimenta, BFI London Film Festival; New Edition, with Poster Club, Edinburgh Printmakers, Edinburgh, (2017); >>FFWD: Artists’ Moving Image from Scotland, Shanghai Minsheng Art Museum, Shanghai, as part of CURRENT, Contemporary Art From Scotland, Phase Two, Cooper Gallery, Dundee; Autumn Screening, Inverleith House, Edinburgh; Ripples on the Pond, Gallery of Modern Art, Glasgow (2015). In 2011 she received the Margaret Tait Award, and in 2015 was awarded the inaugural BFI Experimenta Development Award from BFI London Film Festival. Copestake works as a visiting lecturer at Glasgow School of Art. She often works collaboratively and was a foundation member of two long-term collective groups in Glasgow: Poster Club, a group of artists using the medium of print as a site for collaborative work; and the band Muscles of Joy. An important part of the sound was the polyvocal arrangements combining lyrics, vocables and harmonies with textural sound. Download A community in motion — approximate notes on the work of Anne-Marie Copestake. A commissioned essay written by Dominic Paterson. 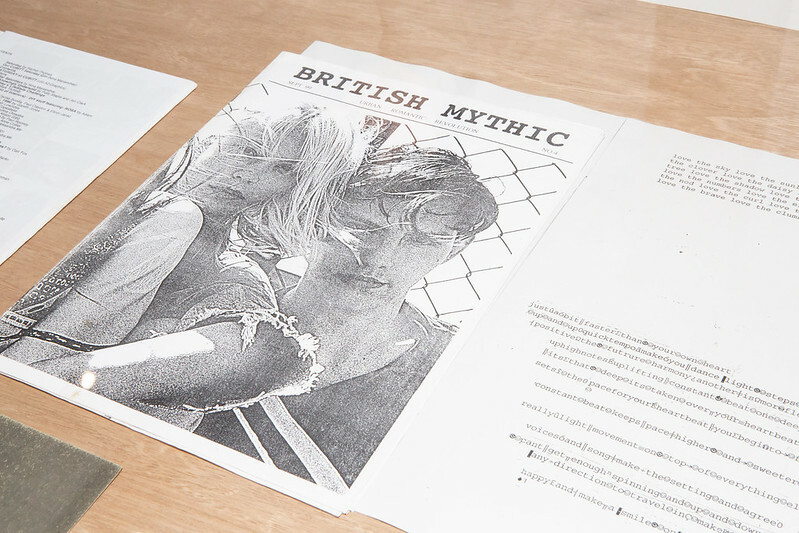 Download a review of the exhibition by writer and artist Alex Hetherington. Image: Anne-Marie Copestake, A love, film still, 2019. The production of A love is supported by Cove Park and Cooper Gallery DJCAD. Film digitisation courtesy the REWIND Media Preservation Lab, DJCAD, University of Dundee.